I am for, "Patient Participation in Medical Product Discussions"
FDA has a very short term docket (30 days closes on Dec 4) about Patient Participation in Medical Product Discussions. Right smack in the middle of Diabetes month Thanksgiving. Not ideal comment time. So DOC, we need your help. Stephen Shaul started the ball rolling to get some comments in. The goal of comments is to be complimentary of the 2014 actions FDA has taken with the diabetes community and ask to keep that going, and maybe step that up with a PDUFA meeting. 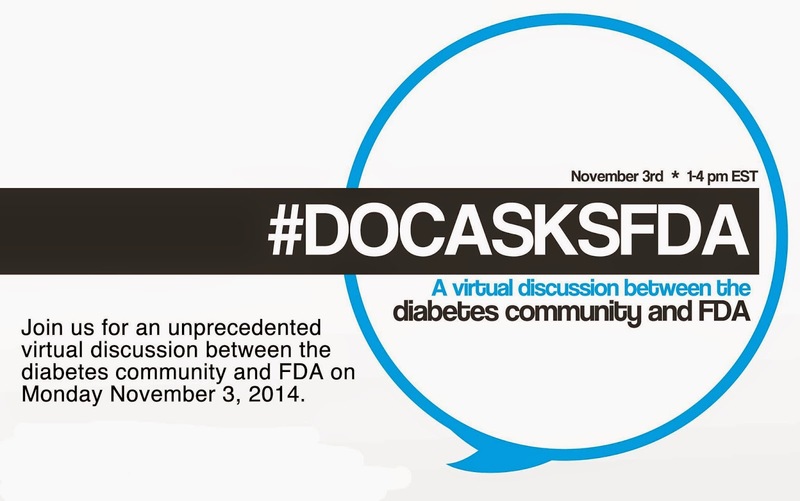 Personally I would like to see most o the comments in the docket be on diabetes issues. Let's dominate the docket. Even if you are only available for part of the conversation, I strongly encourage you to sign up and join the virtual discussion based on our recent collective feedback. 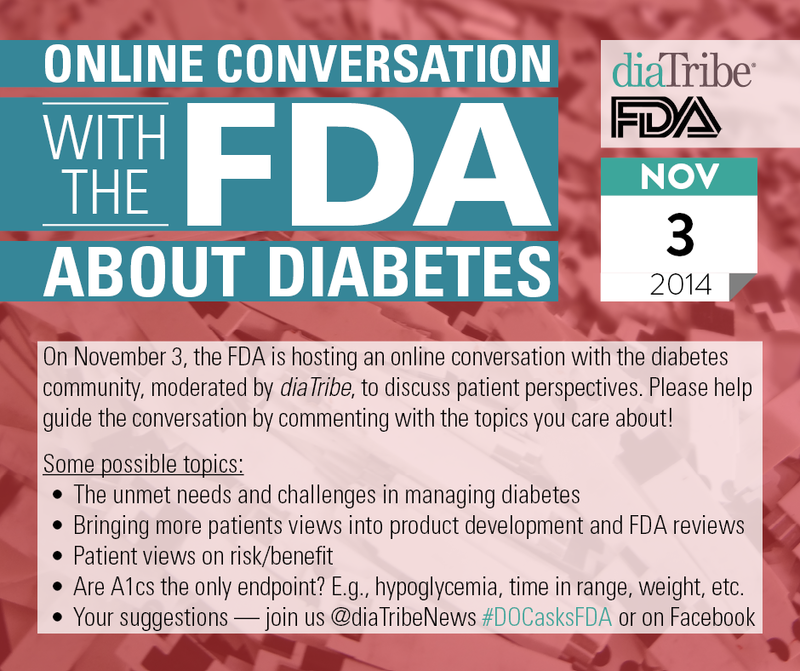 As a community, it is essential that we show the FDA how committed we are to more open communication. Please register and join as a signal to the Agency that you are interested in dialogue, have valuable input to share, and want to advocate for better treatment options for diabetes. Thanks so much to everyone at FDA and diaTribe for making this possible! Today, when I ride my bike, I'll do the Big Blue Test. What activity will you do when you do the Big Blue Test? 2. Get Active. I will ride my bike! 3. I'll Test Again. After riding. In the past, on average, Big Blue Testers have seen their blood glucose level drop 20% after 14-20 minutes of exercise. 4. I'll Share My Results. Answer the questions in the right column of this page. And don’t forget to talk about your experience on social media. StripSafely is at it again! 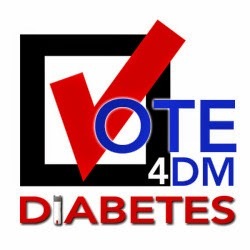 #Vote4DM is a targeted awareness campaign that lets you tell Congress you know that there are three bills related to diabetes on the Hill and they need act on them. Go to StripSafley.com and click Vote4DM above or TWITTER below. Join Tweet-ins 8:00 PM-ish eastern on October 22 and 29. We figured out who is in the diabetes caucus, who has already cosponsored what, and the bill numbers and adjust the Tweets to fit. All you do is Point and Click, what could be easier? "It is impossible to move someone to action without first getting his or her attention," Back to Basics. So lets use simple tools to get attention, when Congress is listening, aka a few days before the election. Will it change a lot of their minds? No. This it help a process of getting attention, start the wheel squeaking and our community asking. With the addition of 'MeterSync Blue,' Glooko's diabetes management platform enables remote patient monitoring by syncing blood glucose readings from more than 30 meters to supported Apple and Android devices. Glooko Inc., announced today the launch of Glooko MeterSync Blue, strengthening its position as the industry leader in delivering a mobile, software as a service (SaaS) diabetes remote monitoring and population management platform. Now patients can utilize Bluetooth to connect any of more than 30 popular blood glucose meters to the Glooko platform on Android or Apple devices, as an easier alternative to a physical connection with the current Glooko MeterSync cable. With the addition of the Glooko MeterSync Blue – featuring Bluetooth Smart™ and Glooko’s FDA-cleared technology - the company’s diabetes management platform provides health systems and payer groups the ability to more cost-effectively enroll diabetes patients into remote monitoring programs without the need for patients to switch to costly, wireless-enabled, blood glucose meters developed specifically for telemedicine. Instead, health systems and payer groups can leverage the tens of millions of meters already deployed to patients worldwide. 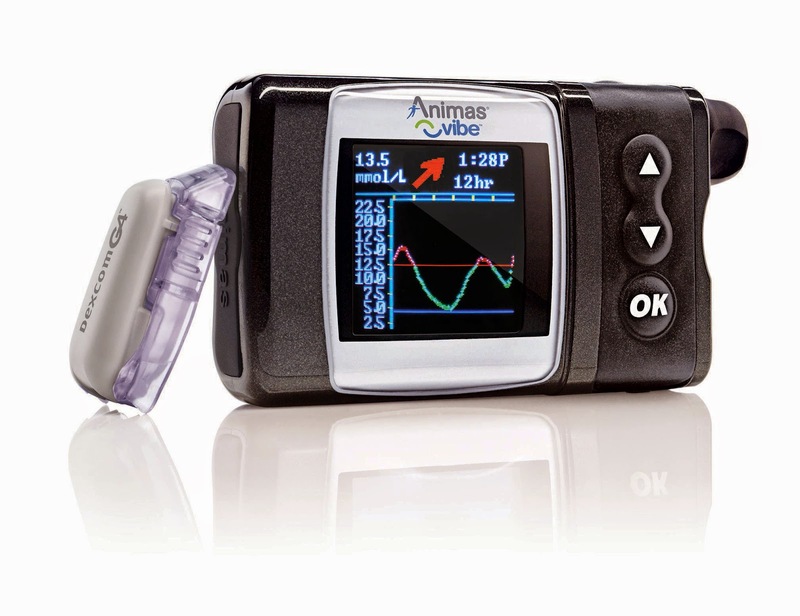 BURNABY, British Columbia, Oct. 6, 2014 /CNW/ -- Animas Canada, a division of LifeScan Canada Ltd., today announced the launch of the Animas® Vibe® insulin pump and Dexcom G4® PLATINUM continuous glucose monitoring (CGM) system, for the pediatric market1 in Canada. "Earlier this year, we introduced Animas® Vibe® to adult Canadians living with diabetes, so we are pleased to expand this offering to the pediatric population," said Paul Flynn, North American Sales Director, Animas Corporation. "Now children and their parents can manage their diabetes with a system that combines a world class insulin pump with state-of-the-art CGM technology." I am a fan of community. The diabetes community in particular and the value it bring by connecting peers and empowering self care. Those connections do even more. “We were very fortunate to be able to conduct this study using Glu, it allowed for rapid recruitment with over 200 of the 243 total participants enrolling within 2 days of announcing the study." One month ago advocates let by Anna McCollister-Slipp had a conversation with FDA on Medical Device Data Systems. In that FDA asked for patents views on the risk and benefits of data, specifically real time data from CGM moving to a device data system to other displays. YDMV wrote the it here. 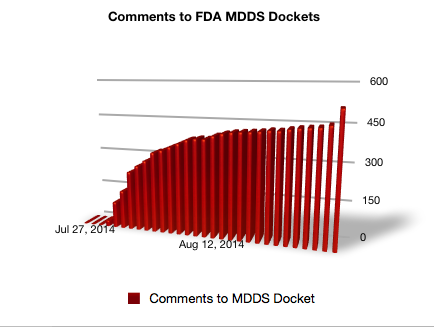 In one month, with enthusiastic support from the CGM in the Cloud Facebook group the community put over 500 comments into FDA's open docket. 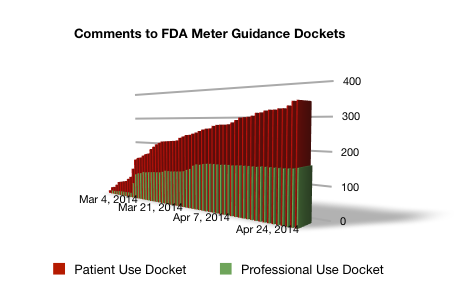 I think that is a record response from the diabetes community to a FDA request for comments. Be a part. Take the MasterLab survey. Insulin-requiring patients 65 years old and older in our retrospective study from a community endocrine practice achieved a significant and durable improvement in glycemic control when using PCGM. The improvement in glycemic control was comparable to that reported in younger patients. The substantial reduction in severe hypoglycemia may be of particular benefit in older patients. Lack of PCGM coverage by CMS was the most common reason sited to not start or to discontinue PCGM use. The goal of every adult with type 1 diabetes, every parent of a child with type 1 diabetes and every person in the care teams of those people with diabetes is a long health life WAY past age 65. To better understand why this matters, please read Kerri's excellent piece at diaTribe on CGM and Medicare. I trust you will feel moved to sign the JDRF's petition. Like Kerri says, use the #MedicareCoverCGM hashtag to help thread these stories through social media like Facebook and Twitter. I fear it may be a long term process to help provide good diabetes care to those on Medicare. Long term processes star with a step. There first step is the petition. More steps to come. Plain language. Avoid jargon and abbreviations, tell you story like you are talking with a sympathetic friend over coffee. Speak from the heart, and to it, your passion should be in the story, up close and personal. Talk about success, make your story be the uplifting example of how things can be better. Be concise. Use details from your success to connect passion and policy. Quality of life over numbers. We want to hear about you and your life. If you use statistics be sure the are accurate and relevant to your personal story. If possible, craft a way for policy makers to be a hero by demonstrating to them how their actions help you stay healthy and successful. Links included in this post. Paris and Valencia, Calif. - August 11, 2014 - Sanofi (EURONEXT: SAN and NYSE: SNY) and MannKind Corporation (Nasdaq: MNKD) announced today that they have entered into a worldwide exclusive licensing agreement for development and commercialization of Afrezza® (insulin human) Inhalation Powder, a new rapid-acting inhaled insulin therapy for adults with type 1 and type 2 diabetes. The companies plan to launch Afrezza in the United States in the first quarter of 2015. Under the collaboration and license agreement, Sanofi will be responsible for global commercial, regulatory and development activities. Under a separate supply agreement, MannKind will manufacture Afrezza at its manufacturing facility in Danbury, Connecticut. In addition, the companies are planning to collaborate to expand manufacturing capacity to meet global demand as necessary. Janssen Pharmaceuticals, Inc. announced today the U.S. Food and Drug Administration (FDA) has approved INVOKAMET™, a fixed-dose therapy combining canagliflozin and metformin hydrochloride in a single tablet, for the treatment of adults with type 2 diabetes. INVOKAMET™ provides the clinical attributes of INVOKANA® (canagliflozin), the first sodium glucose co–transporter 2 (SGLT2) inhibitor available in the United States, together with metformin, which is commonly prescribed early in the treatment of type 2 diabetes. INVOKAMET™ is the first fixed–dose combination of an SGLT2 inhibitor with metformin approved in the United States. On Friday, Aug. 8 from 9:45AM-11:15AM (EST), I will be joining Kerri Sparling, Jill Weissberg-Benchell and Jen Block to present The DOC Rx: The Role of Social Media in Managing Type 1 & 2 Diabetes at AADE’s annual meeting. Our presentation’s intent is to validate the role of peer support in diabetes management. Jill and Jen will explore thoughts gained from reviewing Kerri’s and my lives with diabetes, as well as out interactions with the DOC. Jeff Hitchcock is moderating. I am thrilled to be part of a panel with these super smart folks. The U.S. Food and Drug Administration today approved Jardiance (empagliflozin) tablets as an addition to diet and exercise to improve glycemic control in adults with type 2 diabetes. Type 2 diabetes affects approximately 26 million people and accounts for more than 90 percent of diabetes cases diagnosed in the United States. Over time, high blood sugar levels can increase the risk for serious complications, including heart disease, blindness, and nerve and kidney damage. For more information, please visit: Jardiance. Medtronic is leading the charge on new diabetes devices again, with a first-of-its-kind combo device launched in Europe that brings a continuous glucose monitoring (CGM) sensor and insulin infusion set together into a single device with combined insertion capability! The company announced its launch of the Minimed Duo on Tuesday, after getting CE Mark approval for European sale early this week. 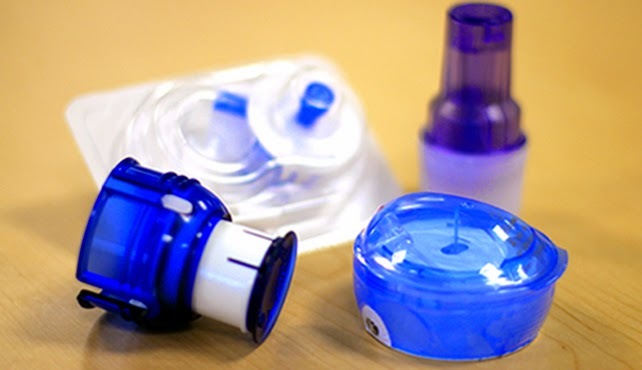 The new Duo uses the Minimed Veo system (which is the 2009-approved European version of thenew Minimed 530G system that was approved in the U.S. last fall) and the accompanying Enlite sensor. The magic here is that the Duo merges the insertion needs for both insulin infusion and CGM monitoring into just one spot on the body — instead of two different sites on your body as has always been required. Note that this is not the full dream of a single cannula — you’d still have two puncture spots on the skin where the steel catheter and glucose sensor go in — but you’d only have to push one button on a single, combined inserter to place both your insulin pump and CGM automatically, plus the needles retract so you don’t have to see them. The Diabetes Technology Society (DTS) this week announced the launch of the DTS Surveillance Program for Cleared Blood Glucose Monitors. This surveillance program will provide independent assessment of the performance of cleared blood glucose monitors following Food and Drug Administration (FDA) clearance against accepted standards, and generate information that can assist patients, healthcare providers, and payers in making the right product selection. Initially the program is being supported by Abbott but DTS says that other BG Monitor manufacturers are currently looking into coming on board. They (and I think all of us in the community) would welcome funding from other sources that recognize the importance of and wish to lend their support to surveillance of cleared BG Monitoring systems to obtain information about the performance of these products. The announcement says there will be patient advocates involved. I asked DTS who that would be and they replied, "Patient advocacy groups will be selected based on recommendations by the Steering Committee and the Board of DTS." I may have thoughts on the matter too. Finally I asked, what do we need to do to make surveillance mandatory, because, I assume it will start as voluntary? DTS's reply was, the program can be made mandatory if a special rule is developed by FDA or if a law is passed by Congress. So there is still advocacy work to accomplish. Diabetes is Big. Policy is Big. They touch at a lot of different points. Because both are big, often one touch point doesn't know what the other is trying to do. It would be glorious, for example, if efforts at prevention were connected to the key idea of access via insurance reimbursement for quality education on how to successfully prevent or at least postpone type 2. Great if third party payers looked at education as the investment in saving lives and expenses down the road that it is, sadly it is not always seen that way. Access to safe school environments. Access to accurate public messages about diabetes. 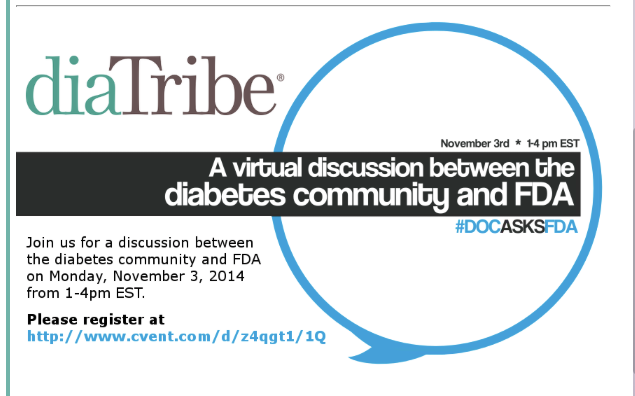 Access to treatment and technology to continue to successfully manage diabetes. Access to research to better treat diabetes. Access to people who can help individuals stay positive and engaged. Advocacy is acting to ensure access. What people need access to may, like diabetes, vary. The need to act with and for each other doesn't vary. If we don't act for better diabetes access, who will? MasterLab - July 2, become a better policy advocate. Yo DOC! How do ya feel about 400? If posts to the FDA docket on personal use glucose meters were held to the 2003 ISO standards for glucose meters, I could claim we have 400 comments and consider that an accurate reflection of 342. 342+20%=410. That's bogus. Let's get a real 400. Commenting is easy. It takes two minutes. The docket is open to May 7. StripSafely asked Who is Accountable for generic test strips. Apparently it is not a academic question. FDA today release a warning titled, "FDA Safety Communication: Shasta Technologies GenStrip Blood Glucose Test Strips May Report False Results"
I kinda know how you may feel. I have been through it. Twice, yes two kids with type 1. But you Diabetes May vary and you anxiety at diagnosis is your own. If diabetes has taught me anything it is to try to have empathy for others, other parents of kids with diabetes, other people with type 1, type 2, what we call type 3 (other parents and caregivers.) In time, I hope you get to the place where you can see empathy as a blessing. You ain't there now. You ain't meant to be. Don't sweat it. There are a bunch of stages of loss, you are gonna deal with them. That is 100% normal. Type 1 diabetes is a family thing. No parent likes putting insulin into a child, the child typically isn't a huge fan of it either. All try to be brave. Siblings face as much stress as anyone, through less parental attention and care and loving fear for their brother or sister. As you work diligently to learn to care for you child with diabetes, work as just as hard to show the non D-kids how much you care for them and the love all they bring to the family. Life has many demands, diabetes will add to them, for now bring all you can to your family - you will find a new normal. Learn about Children With Diabetes Friends for Life. There at Friends For Life, families share the magic of "getting it." Everyone "get its." No matter how much or how little anyone knows there are new things to learn and new friends to walk with you. Your family needs people walking with them. Diabetes is hard. It is relentless. It is best managed with a little help from your friends. Nothing against your existing friends, they are wonderful people I am sure, few will appreciate that behind what you project as normal is the ever present reality of diabetes care. A few may prove they weren't true friends, such is life. The diabetes community will embrace you, peer support makes diabetes care much less stressful. Join the forums at CDW, join #DSMA chat on Wednesday nights 9:00 easter on twitter. Let other walk with you. You can do this. Over the years YDMV has created a collection of Newbie posts, most are silly. There are here if you need them. There are also a few focused on that "why me" stage, those are here. What really matters is we, a community who gets it, are here and here and here and here.... well way to many places to list, but all are here for every newbie, parent, adult, child, teen, caregiver and friend living with diabetes. Welcome to the club. Sorry you are here. Family history can be cool. The baby here is my dad. The Navy officer my granddad Vernon, Fred C. Dunlap my great grandfather is on the left. 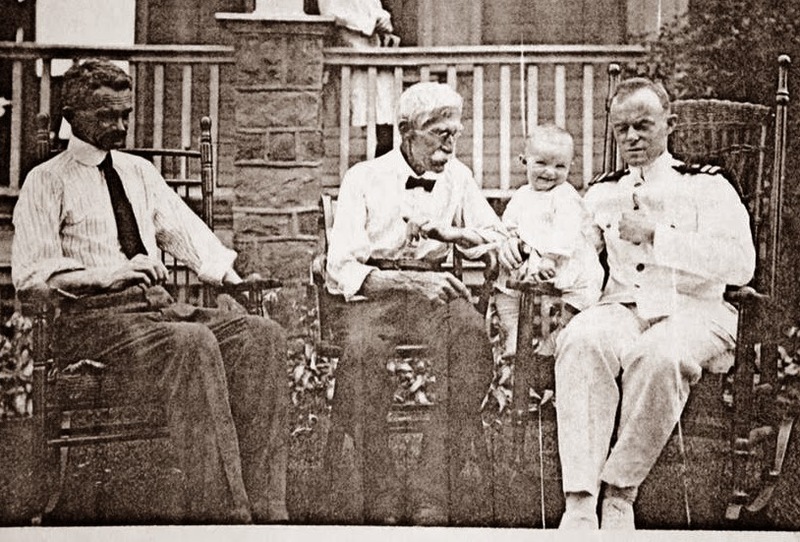 The awesome 'stache in the middle is George W. Dunlap my Great Great Grandfather. He was on the receiving end of Pickett's Charge. For his sake, and all the rest of us that have come after, that small stone wall at the "high water point" is looking real good. Some place in that picture, is a history of type 2 diabetes. It may suggest full on T2D, for me, is just a matter of time. I am what some folks call “Pre” type 2. Nothing against the family history, I want to stay on the “Pre” side of the T2D time line. I could use a stone wall of my own. I have made changes in how I eat and some of what I do. I can still do better. My fasting numbers have been creeping up, so my Doc. and I chatted. I needed to see what my insurance covers. Joy! What is more fun than calling the insurance company? Here's the thing. I have had some success with A1C. Like I said some call it “Pre.” I am more aligned with Riva on "Pre" not being a real thing. Still, I am less than some thresholds of full on T2D. Like my insurance company's. They say by their measure it ain’t high enough. I can’t get no education. Ever notice how many tunes have Doctor in the lyrics? All those songs about doctors and this is what rings in my head. At the risk of sounding like one of the Borg collective from Star Trek Star Trek: The Next Generation, I was 6 of 17. 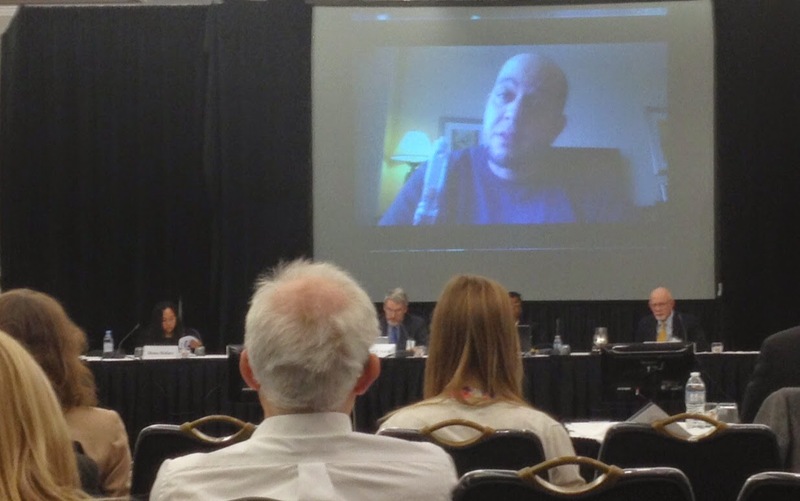 One of a diverse group of people who spoke at the Afrezza ADCOM meeting. It was an interesting day. It overstate things, possibly wildly, but I’ll describe the day as MannKind spoke about the wonders of their insulin and FDA showered upon it a lack of love. Pubic speakers talked of a need for options. The panel considered risk, patient needs and in what the called a difficult choice voted almost unanimously for the drug. I don’t know what FDA will do, approve it or not. They have to July 15. I do know that those who spoke with me were a fascinating group that spanned the cross section of the diabetes community. There were a number of physicians who treat PWDs, CDEs who teach PWDs, ADA and JDRF that represent PWDs, and a mix of type 1, type 2 and type 3 (caregivers) people who live with diabetes. I have not seen as wide a mix at any previous FDA meeting. Nor I had not seen anything like Manny Hernandez’s video presentation, bringing views into the room from a champion who could not be there physically. He spoke of reactions to the drug at tuDiabetes and estudiabetes. He spoke in Spanish, with subtitles when representing Spanish speaking American. That was an appropriate first in my experience. Through the diversity of speaker, the message could not have been clearer if we had sat down and scripted it out. In fact one public speaker commented about that, noting that we had not. There is not one best way to manage diabetes. People with diabetes need more options to consider with their health care professionals. Doctors and patients should consider care plans that reflect individual lifestyles, fears and aspirations. There is an emotional component to care, some folks are afraid or needles. Some shy away from the stigma of injecting in a restaurant, plane or other public place. Some fear hypoglycemia. Others reached unprecedented control with an ultra fast acting insulin. Following the public comments, it seemed that in addition to the critical safety issues, the panel also considered the psycho - social aspect of diabetes self care. All too often, it seems to me, these are overlooked with words like adherence and compliant. I hope the panel would have had those discussions without the hour of public comments. In the hand full of these meeting I have attend, that as not been the case, certainly to the extent we saw on April 1. I hope this was not some twist of April Fool’s Day fate. I hope that the broad community of physicians, CDEs, Big Advocacy and individual PWDs will continue speak in one voice because more options means better care. No doubt, the idea of options will need to be better appreciated by third party payers. We can help. Advocacy, just like good diabetes care, work best with a team, doctors, educators and advocates all working with and for patients. 2 Comments Labels: Advocacy , FDA , Team.